Last week, Tuesday, I hit a year of CrossFit. A whole year of doing an exercise regiment at least twice a week (every once in a while only once). That is unheard of in my reality! I normally get bored or tired of a specific exercise and end up quitting. However, CrossFit is always different. I’m pretty sure that’s why I stuck with it so long. My first workout just about killed me. Yep, 5 rounds of 15 Overhead Squats with a wooden dow and a 100 Meter Sprint. Took me 12:30 minutes. I can laugh now because I realize just how out of shape I was. So, what was my workout on my anniversary? I have to be honest. I didn’t think I was going to finish that “chipper”. This was one of the few times that I was both disappointed with myself and thrilled with myself. I was disappointed because I had to drop down to the black band, partly because I tore my hands and partly because my upper body gave out pretty quickly. However…I finished! With minutes to spare even! I’m about 20lbs lighter than I was when I started. The fact that I’ve kept that off is great as well! Now, if I could lose more my pull ups would be a little easier. While I’m getting to where I want to quit CrossFit for a bit…just take a break from the intensity, I’m still glad I’m going once the workout is done! What workout/exercise routine have you had the most success with? This entry was posted in Home, Progress, Thankful For..., Workout and tagged 400 Meter Run, Anniversary, Crossfit, Kettlebell Swings, Pull Ups, Push Ups on November 28, 2011 by Tammy. The last time I did Fran, I finished in 13:13. Of course, I was also having breathing issues but I’m still glad at my improvement this go ’round. 1) Last time I used 65#s then had to drop down to 45#s, was able to use 65#s for the entire WOD. 2) I used a black band last time, used the green band the entire time today! It was tough, but I felt good! Of course, I ripped my hand open again. Fun times! I was able to do 11 thrusters in a row without stopping. I have days when I feel like I’m not progressing, in fact like I’m going backward, but today I felt like I was stronger. 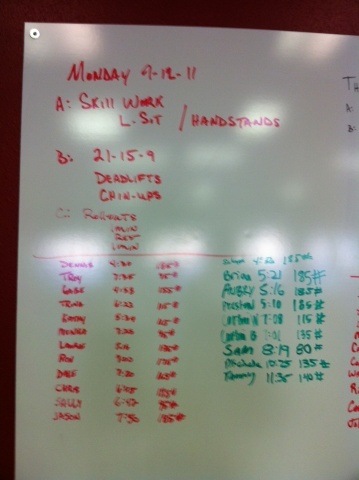 This entry was posted in Workout and tagged Crossfit, Fran, Pull Ups, Squat Thrusters on September 26, 2011 by Tammy. Today was my first crossfit workout since my throat dilation last week. Wow, has it only been a week?…it feels like I haven’t worked out for a month. My husband and I got some hiking in when we went to Nevada/Utah last week and that went pretty well. However, today’s workout was better! I was still a little slow. I used too much weight on my deadlifts out of the box and fatigued my back muscles so had to drop down. This time I only stopped to reset my deadlift form and try to stretch my back a little bit rather than stopping because I was sucking air! It normally bothers me when I’m so much slower than the rest, but I feel pretty good about this workout. I think after a week or two my workout level will increase again and I can’t wait! I was doing ok on the Pull Ups but didn’t do as well as I had hoped. Unfortunately, my calluses on my right hand tore off during round #2. 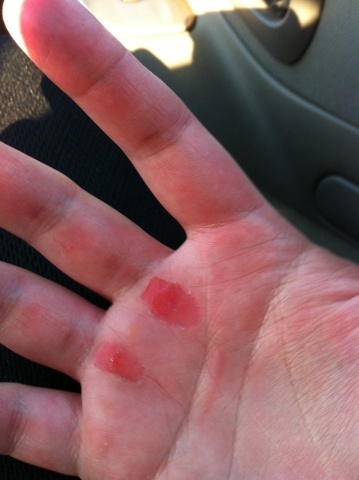 Shane told me to try to keep my hands in one place during the pull ups but sometimes my grip just doesn’t feel right. However, I will try to keep my hands stationary and a little wider out. How is your training going?! This entry was posted in Health, Workout and tagged Crossfit, Deadlifts, Handstands, L Sits, Pull Ups, Roll Outs on September 12, 2011 by Tammy.